What do Meryl Streep, Jude Law, Johnny Depp, Kate Moss, Chris Pine, Tracey Ullman, Jeremy Irons, Tom Ford and Sean Penn have in common? 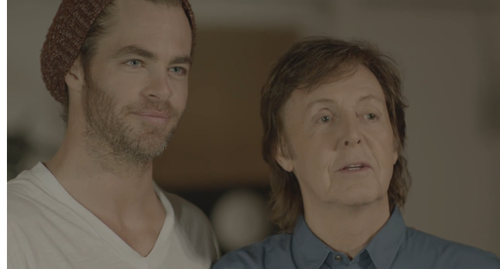 They’re all in Paul McCartney’s latest music video for the track ” Queenie Eye” off his latest album, New. It’s like the Sgt. Pepper’s album cover come to life, only with Hollywood actors instead of historical luminaries. There’s some regular — if extremely photogenic — folks in there too. Speaking of, how come McCartney still doesn’t look a day over 64? This is not the first time Depp has appeared in a video – you can find him all over the clip for Tom Petty’s “Into The Great Wide Open.” You don’t see Meryl Streep in one every day though, so there’s that. The bigger news may be that “Queenie Eye” is a highly enjoyable song from what is probably McCartney’s best album in years. Read our review here.